*I sat & watched a guy trying to figure out whether or not to buy an engagement ring today at the store. I had the best time watching him decide. He looked & held the ring. Got the price ($2800 ... which was 55% off) & just stared at it for 10 minutes... put it back... walked away... made some phone calls... came back & held the ring again... then I had to leave. I so badly wanted to see how it ended - but Ricky was ready to go at this point... Oh, I hope this guy has a wonderful Christmas! Ricky had fun teasing me how nosy I am... but how can you resist romance during the Holidays? If I was REALLY nosy & followed my blogger instinct, I would have pulled out my camera & taken pictures of the whole thing! *Can we talk Biggest Loser Finale folks?????? WOW! Danny!!! Wasn't he Amazing!?!? And Rudy too! For both of them to have lost over 200 lbs like that - INSANE! But I know the topic of the night for me was Rebecca & that blond hair.... oh mercy! I loved her black hair do... thought the blond made her look older. Here she is with the hair I like... & I loved she was still sporting the arm contraption they wear on the ranch when she was on Leno. I want one just so I look like I'm doing something! 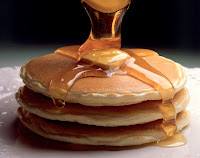 *I am now officially addicted to pancakes... I had never made them before & since I am Miss Cook, I thought I'd follow that complicated receipe on the Bisquick box (quit laughing - its true!)... & I made them... & now, wish I hadnt. I want pancakes ALL THE TIME now! *which leads to the "SPAT OF THE WEEK" - Pancakes! Ricky is so dang picky with the pancakes... "this one is too doughy, this one is too thick, this one smells burnt, this one isnt perfectly circular & round"... UGH... I want to say in the voice of the soup Nazi from Seinfield - "NO PANCAKES FOR YOU!" *So I hate to even admit this... I havent been that much into "So you think you can dance" this year. Is it just me? Dont spoil anything for me because I havent seen this week's cuts yet - but I do love the married couple... is some one going to tell me Ryan's gone? or his wife since she didnt even get to dance this week?... I personally think they shouldnt have put the next season on so close to the last...anyone else not feeling this season? 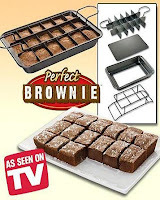 *I dont even like brownies, but I am so interested in the "Perfect Brownie" pan... why didnt someone think of this sooner? It makes so much sense! Will it work for cake too? Or is that too "soft"? *Sunday is our Christmas program at church... I love to sing with the Ensemble... some beautiful voices in that crowd. Its always funny for me though because I have a pretty deep voice for a woman & sing normally tenor - so I'm always in the back with the guys! I wanna join a men's tenor group & tour with them... mix it up a little! *How about that GLEE Fall Finale? (And what's the deal with having Fall Finale's?????) Mercedes singing "And I am telling you"... Girlfriend can SANNNNGGGG. And I wondered how they were going to do the Sectionals since we already seen all the songs. Pretty slick Glee writers, pretty slick! 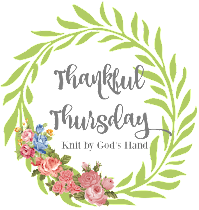 And the truth is out on everyone... Puck's the daddy, crazy wife isnt pregnant, Hot Teacher has left his wife & kisses the quirky guidance counselor... sigh... happy endings! And Sue is taking some time to tan & become even more evil....Love it! Rachel got to sing an awesome Broadway tune & be the star!!! Loved how they put all the dance moves from the whole season into that last song too... I had chills!!!! Now off tomorrow to totally pick up my GLEE 2 soundtrack! Hope you all have a Fabulous Friday!!!! I love Glee! :) The finale was so good, I'm just sad that I won't get to see it again until April. Rebecca's hair looks so much better in that photo...I was feeling the cropped blonde look, at all. Yes, Glee was phenomenal! I absolutely LOVE that show! Wish it wasn't on hiatus! Boo hoo! I make pancakes all the time! However, I buy the big bag of Krusteaz mix at Sam's club; it lasts much longer! I always add a bit of ground flaxseed to make them a bit healthier...you can't even taste it. We loved the Glee finale! And though I have never bought a show on DVD, I have Dec 29th marked on my calendar, which is when Season 1 is released on DVD. I missed a few of the earlier episodes, so I can't wait! Have a great time at your Christmas program! I puffy heart GLEE!! The last few episodes have been AMAZING!! I can't believe we have to wait until the Spring to see it again. I'm so sad Glee is over! Im going to miss it so much. Go watch So You Think You Can Dance! Just surfing around SITS. What a great site. I'll be back soon for sure! Oh, I always watch guys at the jewelry store! Love it! Since I live in a military area, there are always these super young guys with crew cuts standing around looking lost. I pray for them and their girlfriends, because goodness knows those military families need it! And I sooooo had to laugh at the tenor comment, LOL!!!!! what a great week you have had. I think you need two pillows for you dogs.. Too cute.. I hope that person enjoys her ring. OH how I love to see people in love and happy. I love pancakes. I think I'm the only person who did not watch Glee. I will have to see if it is online! I almost bought one of those brownie pans yesterday, it was the FIRST thing I saw (along with the GIANT cupcake pan) I saw when I walked into the market. I did not watch all of BL this season, but watched the end of finale night. I had to look on line to remember who Rebecca was... not recognizing her with blonde hair. I agree, she looks older! Now I'm dying to know if the guy bought the ring, what 55% off! OMGosh Rebbecca and the blonde hair she walked out and the first words out of Rick's mouth she looks older! That is so funny you thought the same thing. I like her with the darker hair, but way to go Pink! Brownie pan man when am I going to invent these amazing things? And Glee ... WOWZERS and Sue kills me. It was so weird to watch her in Julie and Julia last night I rented the DVD. Romance - definitely my senses are hightened for it during the holidays. That guy will have a fabulous Christmas is he's getting her THAT ring! Pancakes...yum. Glee - I've only seen one episode! How sad it that? SO NOT feeling SYTYCD either this time. I've tried, but I just can't really get into it. I to feel they had the next season too soon. But I love the married couple as well. Our CHRISTmas program is Sunday as well. I'm making the kids go to the 8:30 am service and then taking them out for Breakfast. Yay!!! Oh dear oh dear oh dear where to start this comment? I love SYTYCD, Biggest Loser, AND Glee-- and watched them ALL this week (despite the fact that two were on simultaneously!). OK, first, the Glee finale... sigh. Do I really have to wait months for it to return? Best show on TV right now. Next, Biggest Loser. I cry every year watching the finale, saying, "Oh, but they're ALL winners, they got their lives back!" But this year's finale was incredible! And SYTYCD-- that show has been my favorite for YEARS, but I am with you, they shouldnt' have let the seasons go back to back. They needed to take time off to build hype! I so love Glee and Biggest Loser! I just posted (briefly) about watching the finales this week. I'm glad another BL starts Jan 5th, it will make waiting for GLee to come back on in the Spring a little more bearable. Oh and I forgot! Rebecca looked fantastic body wise and I am so happy for her. But I do agree she looked much better with the longer darker hair. It did make her look older. When she came out it took me a min to even recognize her. 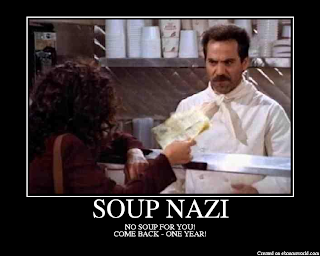 Ah, yes, the Soup Nazi...one of my favorite Seinfeld creations! Listen, I also wanted to thank you soooooooo much for stop­ping by on my Spe­cial SITS Day. It’s taken me a while to get back, but I hope to see you around the blo­gos­phere again soon! Have never seen Biggest Loser but love love love Glee!! Pancakes with peanut butter and syrup. OHH that's so good. And don't forget the bacon. Oh my now I am hungry. I have never watched Glee, or the dancing show. I really miss the Biggest Loser. We only get 2 channels now that it is all digital, and that is with a converter box and a new antenna. I think all the dogs need a bed. Each maybe? I got engaged at Christmas. My husband surprised me with it. He probably looked much as the young man did. It turned out well for my husband. I'm surprised you've never made pancakes before. We rarely make them, but I do like them. Kendall is addicted to crepes. Maybe you can try those next?! I'm having a ball singing in my first adult choir. Our concert is the 23rd, and I'll be bummed when it's over. Awww I love spoiled puppys!! That guy buying the engagement ring sounds really sweet. I love things like that too! Oh I loved Glee. So fun!! I must say, I didn't like how they ended Glee...the breaking up of a marriage is never romantic. Other than that, I loved it, but the last 30 seconds definitely left a bad taste in my mouth, even though it was predictable. I was curious how they were going to do sectionals...very clever! What do Tiger Woods & I have in common?